that My name is Yahweh. God tells us His Name is Yahweh. If you read through the Old Testament and pay attention to God's Name, you will notice that God's Name is everywhere in the Old Testament. I never realized God's Name is so significant until one time when I attended a training session given by my teacher, Pastor Eric Chang telling us that the name of God - Yahweh appears close to 7000X in the Bible. My immediate response was: "Wow! That's a lot!!!" I went home and searched the concordance: Yahweh occurs 6,828 times in the Biblia Hebraica Stuttgartensia edition of the Hebrew Masoretic Text. 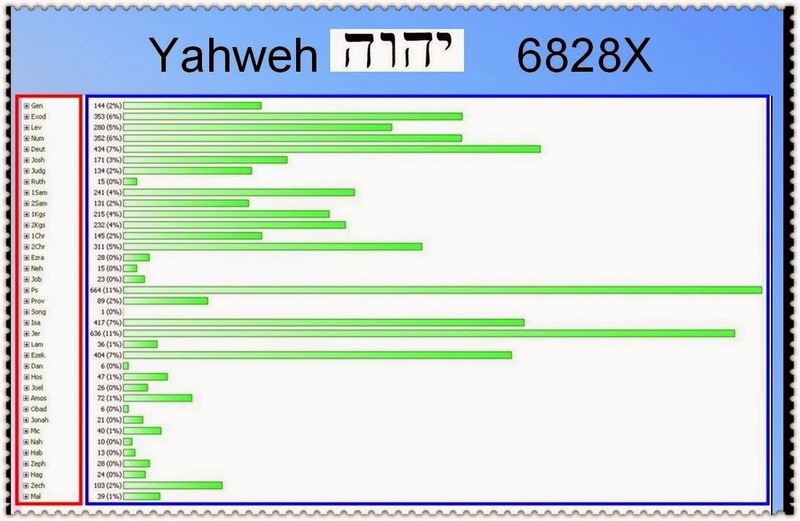 Take a look at the above Bar Graph of the occurrences of Yahweh. Yahweh appears in the Bible 6828X. The left column inside the red box contains the list of Old Testament books. The green bar graph inside the blue box gives you a visual view of the number of occurrences of Yahweh in that specific book. There are a lot of insights we can draw looking at this visual graph. From the above Bible statistics, this should alert us that the Bible is Yahweh Centered. 1. Yahweh is the most important subject in the Bible. 2. God wants us to know His Name - Yahweh. When the Name of God, Yahweh, appears so much in the Bible, we must put our focus on the Name of God, Yahweh, when we study His Word, when we share about God with others. God places so much emphasis on His Name. We too must put emphasis on His Name too.